Marshall Hawkins mentor relationship with Casey Abrams will appear in a future issue of Down Beat magazine. 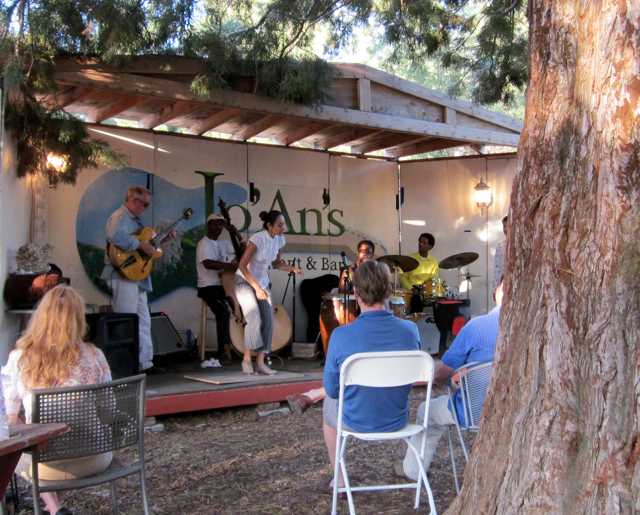 Marshall, who helped start the successful Jazz in the Pines event 18 years ago, brought two nights of jazz music to Idyllwild locals and jazz lovers during his first-ever Town Jazz event Aug. 27-28. 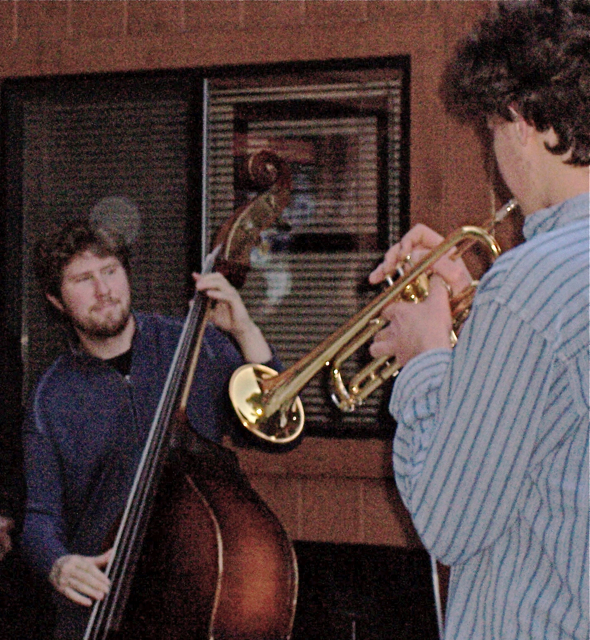 Marshall heads up the Jazz Department at Idyllwild Arts Academy and has played with the likes of Miles Davis. With more than 200 in attendance each night, Marshall plans to host the event next year. Proceeds went to his charity, Seahawk MOJO, which brings jazz to the grade schools in Idyllwild, Hemet and San Diego. “First of all, I miss you and your crazy classes. And second, you are the reason I got into music on a new and much different level. 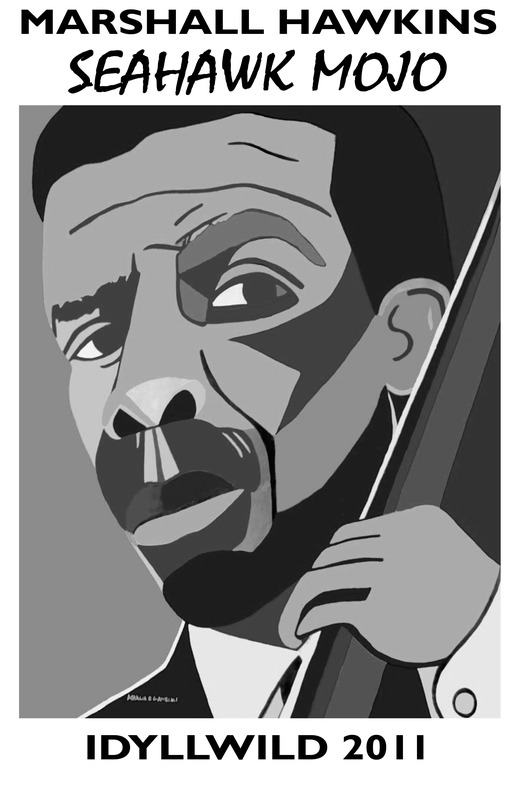 I would have no idea how to even TALK to another musician–you gave me the language, the knowledge of chord structure, all the possibilities of the bass line, and most importantly, the love I have for jazz. Casey Abrams (with Caleb Hensinger, Idyllwild Arts) has credited Marshall for his love of jazz music. Photo credit: ME Gawecki. When Casey was competing on the 10th Season of “American Idol,” he credited Marshall as being his mentor. “He mentioned it several times on national TV,” said Pam, who was taking tickets Sunday night for Town Jazz. Sometime in the future, a national magazine will feature a story on Marshall and Casey’s close relationship. Carl L. Hager, a freelance writer who has written about Casey before, said he plans to show his article to different magazine publishers with jazz listeners in their readership. “It is possible Down Beat could eventually publish it, or it might end up with Esquire or GQ or Rolling Stone, that hasn’t yet been determined,” Carl wrote in a recent email. Commemorative Town Jazz T-shirts are still available for $15 each along with full-color posters at The Spruce Moose. All proceeds go to Seahawk MOJO. Despite the steady rain at showtime, the second evening of the outdoor Town Jazz concert went on without a hitch Sunday night, Aug. 28. Concertgoers were treated to an evening of jazz under the stars, along with a guest singer, tap dancer and African percussionist. Many concertgoers had come straight from the Jazz in the Pines concert at the other end of town. The rain wasn’t going to keep them from a steady diet of jazz. They were used to the sudden rainfall because it happened the day before. Sunday evening’s Town Jazz concert didn’t disappoint the 150 or so who attended. On the bill were the same fine musicians who played the night before, including Daniel Jackson, Gilbert Castellanos, Bob Boss, Brett Sanders, Mikan Zlatkovich. Najite replaced Latin percussionist Roy Gonzales, yet special guests Yve Evans and Roland Esquire Jones remained. Scott, from Mountain Harvest Market, was among the few who grabbed one of her limited CDs. He had it in hand and was grinning from ear to ear. Yve’s voice had that affect on everyone. “I have just a few that I brought with me,” Yve announced, and there was a rush from the audience. Another unexpected highlight in the show was Claudia Gomez, a tap dancer, who did a nice number on a small piece of wood laid onstage. Marshall said that he had just met Claudia a week earlier, and was glad that she wanted to perform with the band. Jeffrey Taylor, from Green Cafe Internet, chatted with Claudia afterwards. The Nicholas Brothers were a tap-dancing team popular in the 1930s. Among their fans was Gregory Hines. Jeffrey had shown a documentary on the Nicholas Brothers two days earlier. Pam Pierce, a volunteer and the mother of “American Idol” heartthrob, Casey Abrams, said that Casey had sent Marshall a congratulatory text. Casey was currently on the Idol Summer Tour and couldn’t be there to perform. Marshall is Casey’s former teacher from Idyllwild Arts Academy, and the two remain close. He said that Town Jazz will definitely return next year, and he’s making plans with more musicians and sponsors. However, the venue will remain the same. “The owner of Jo’An’s said that we could come back every month if we wanted,” Marshall said. Given the fact that he heads up the jazz department at Idyllwild Arts Academy, and performs with his band and other gigs, it may be hard to pull off a monthly jazz show, he said. “We want to keep the focus on Seahawk MoJo (his charity for jazz in the grade schools), and not just working as musicians,” he said. Jon Stonitsch, from The Spruce Moose, one of the sponsors, said that he especially liked the jazz on Sunday evening. Bryan Tallent, also from The Spruce Moose, said that the Idyllwild Business Round Table is already trying to nail down a date for the 2nd Annual Idyllwild Town Jazz concert. “We have to get a commitment from those musicians before they go somewhere else,” Bryan said. Most of the musicians were not tied to the Jazz in the Pines event held the same weekend, but came up because of Marshall’s invitation. “I’m not certain, but I think only one of the guys played at the jazz fest,” Bryan said. Ticket sales were steady both nights, along with commemorative posters and T-shirts designed by local artist Marcia E. Gawecki. The remaining 35 will be sold for $15 at The Spruce Moose located on the top level of The Fort. 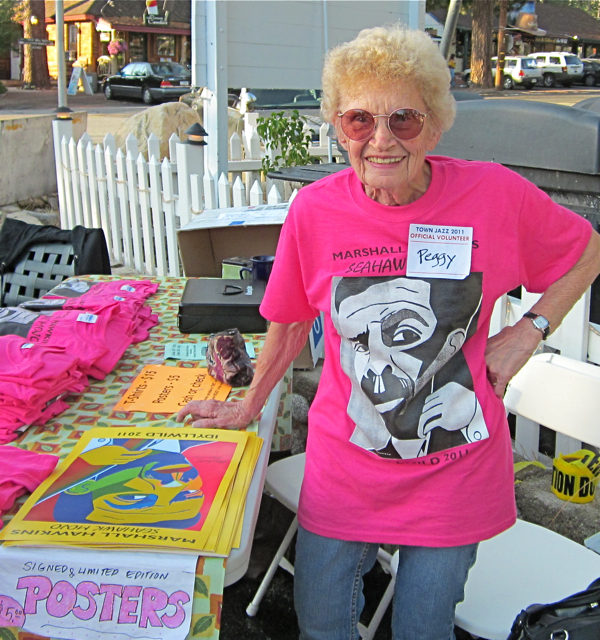 Volunteer Peggy Gawecki shows off the limited edition Town Jazz T-shirt with Marshall's image. “Those T-shirts will be worth double the price next year because it was the first Town Jazz event ever,” Marshall predicted. 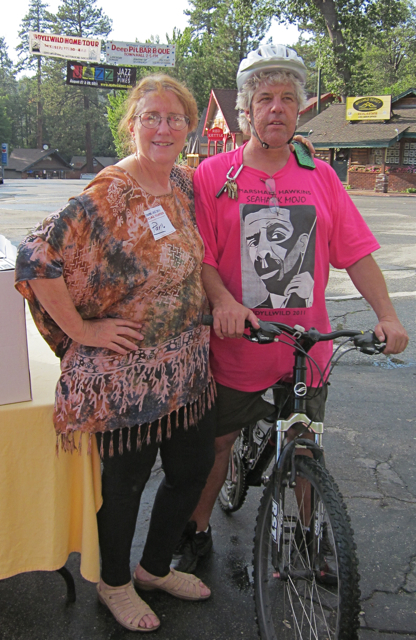 Jeffrey Taylor was one of the first to buy the fuchsia T-shirt at Mountain Harvest Market, and wore it both days. “The design is nice, but pick another color next year,” he said with a grin. 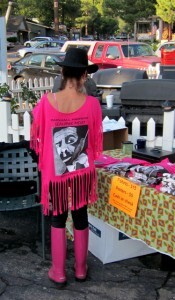 Many of the male jazz goers didn’t like the hot pink shirt, while others like Tressa, a volunteer, embellished it with tassels, giving it a Mardi Gras look. “I learned how to do this design in San Tropez,” Tressa explained. She took the oversized Marshall T-shirt and cut 1-inch tassels into the neck, sleeves and sculpted the bottom edge. Several women asked her how they could do it to theirs. No final profit/loss count was available, but Doug Yagaloff, from Mountain Harvest Market, said he was pleased with the turnout and ticket sales. The posters and T-shirts added a lot to the event too, he said. “We didn’t have much time to plan this year’s event, so it turned out pretty well,” he said. 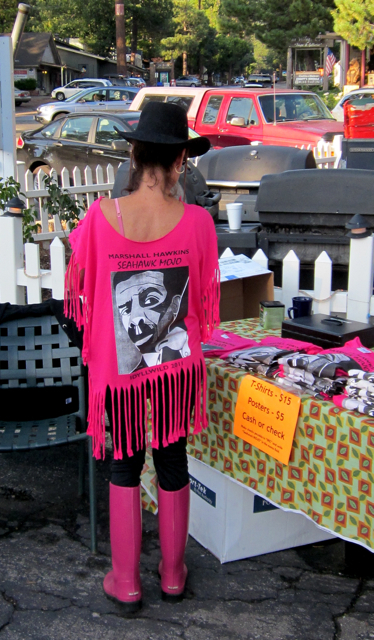 A limited number of Marshall Hawkins fuchsia T-shirts ($15 each), and signed posters ($5 each) are still available at The Spruce Moose, located in the Fort at 54225 North Circle Drive in Idyllwild. For more information, call (951) 659-5556.